famous front steps that are a favourite spot for photos! Soon after Christmas Day, parents and students can feel a subtle shift in the mood because it will be a matter of days before the school term starts again. After eight full weeks of holidays, I can recall how difficult it was to adjust myself to the thought of going back to school. The days of carefree fun and waking up at odd hours will soon be over when I must return to a rigid routine of waking up to the ring of the alarm clock and dealing with loads of homework from school. As my sisters and I outgrew our school uniforms and canvas shoes each year, my mum will buy us new sets of uniforms and shoes while our old uniforms were recycled among us as the second set of uniforms in our wardrobe. 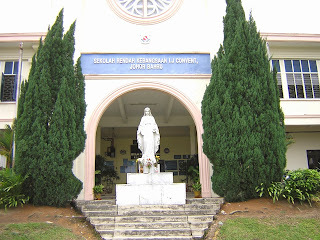 In those days, the uniform of the Convent of the Holy Infant Jesus Johor Baru comprised a white short-sleeved, front-buttoned blouse matched with a navy blue tunic designed with three box pleats on its front and rear, and was worn with a matching blue belt. With a family of three daughters, my eldest sister’s tunic will be handed down to our middle sister while I will inherit hers. Like most school-going kids back then, our shoes were bought from Bata. I can recall wearing slip-on canvas shoes throughout my Primary School because I did not know how to tie shoelaces. At that time, Velcro was unheard of and it was much later in upper Secondary School that I progressed to wearing the laced-up Bata Badminton Master which was then considered cool shoes! I remember there were book lists for parents to buy our text books prior to the school year and there was usually a trip to the school bookshop to get the required books. 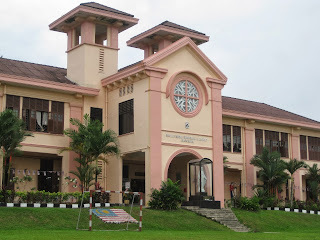 Sometimes when the school bookshop ran short of supply we had to go again or visit the book shops along Jalan Ibrahim like Johor Central Store or the Abdul Wahab Store that also stocked text books. Then my dad would help us wrap the books in brown paper and write our names on the covers in his curly cursive handwriting. Besides inheriting old school uniforms from my sisters, I also remember inheriting their used text books. I didn’t mind it because they were in the classes above me and it was economical for me to use their old books. But I must admit that I was always thrilled if there was a change in the school syllabus and I finally got one or two new books to enjoy the pleasure of smelling the pungent ink as I turned the clean, crisp pages! Other than from a change in the syllabus, the only new books I can expect each year are the exercise books. In Primary School, students should have at least one exercise book for each subject and I remember we had lined exercise books that had the school name and crest printed on its standard brown covers. I cannot recall if the back cover was blank or had any prints but these days, most exercise books come with back covers printed with the Rukunegara or National Principles, our State anthem and helpful 2 to 12 times-tables! 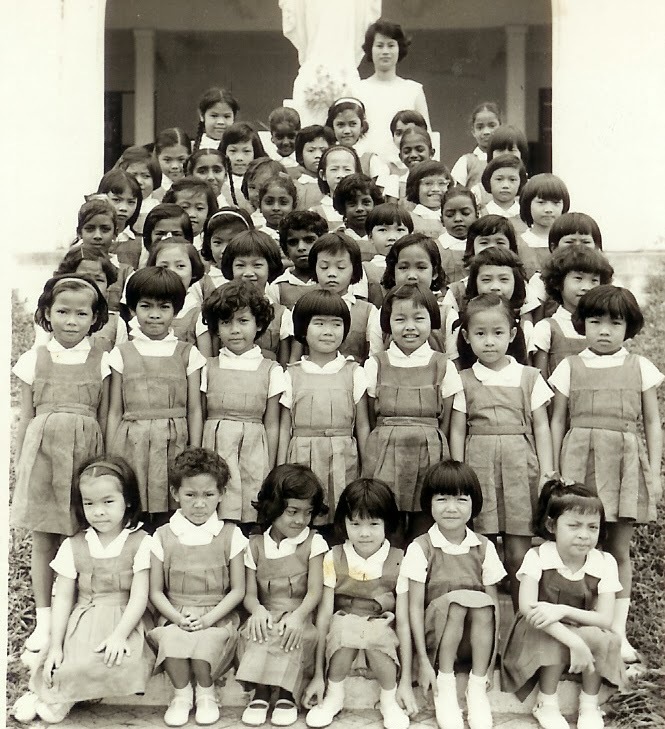 With a year of going to kindergarten in St Joseph School, I was prepared to go into Standard One of the JB Convent’s Primary School. 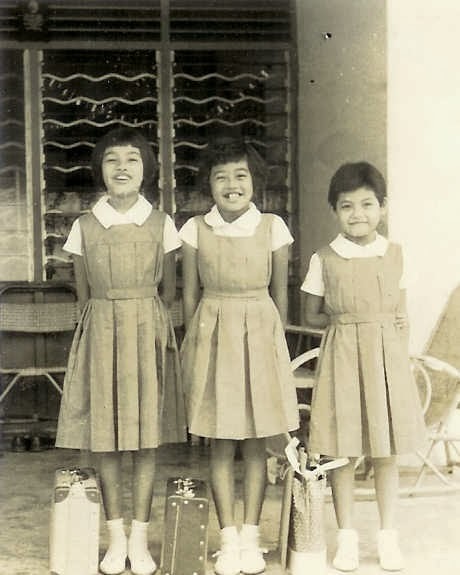 I cannot forget the pride in finally wearing the school uniform and joining my older sisters to go to school as well as the excitement in meeting several familiar faces of kindergarten classmates in Standard One Green. 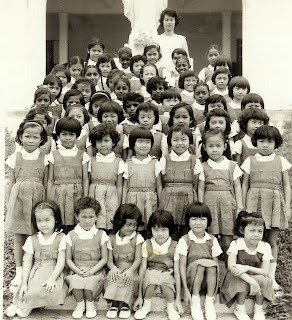 Back then, there were no organised Bas Sekolah services yet so my parents arranged from a Mr Tan who had a provision shop in Larkin Gardens and also provided school transport, to ferry us in his car. Throughout my school years, the weekend in Johor was Friday and Saturday but mission schools like the JB Convent and St Joseph School maintained their weekend on Saturday and Sunday. Since 1994 the weekend in Johor was officially changed and all schools enjoyed Saturday and Sunday weekends but on Nov 22, the Sultan of Johor, Sultan Ibrahim Sultan Iskandar, declared that Johor’s weekend will revert to Fridays and Saturdays. So from 1 Jan 2014, the JB Convent will mark their first day of school and a milestone in its history with its weekend now changed for the very first time, to Friday and Saturday. Every year the start of the new school term will be chaotic as parents usually take their first-year kids to school and inadvertently cause massive traffic jams near school zones. If both or either of the parents worked in the private sector where their weekend is maintained on Saturday and Sunday, their family time is limited to only Saturday, their common day off. With the busyness of modern families today, I just hope that this weekend change will impact the children positively and help them make fond memories of a new chapter in their school life. family heirloom that's always on our tree! All too soon the year 2013 will be over. Looking back, the past eventful 12 months had many ups and downs, filled with much excitement as well as a great deal of emotion. 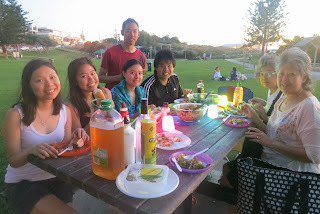 Last September, after Ruby, our eldest sister, my brother and I went to New Zealand and Australia, we shared our photos with Pearly, our middle sister in the UK, saying that she must join us for our next trip to Perth. Little did we know that through this time, Pearly was secretly planning with my nephews and cousins in Australia for an epic trip to Perth – Sydney – Singapore before coming to Johor Baru and leaving from Kuala Lumpur! 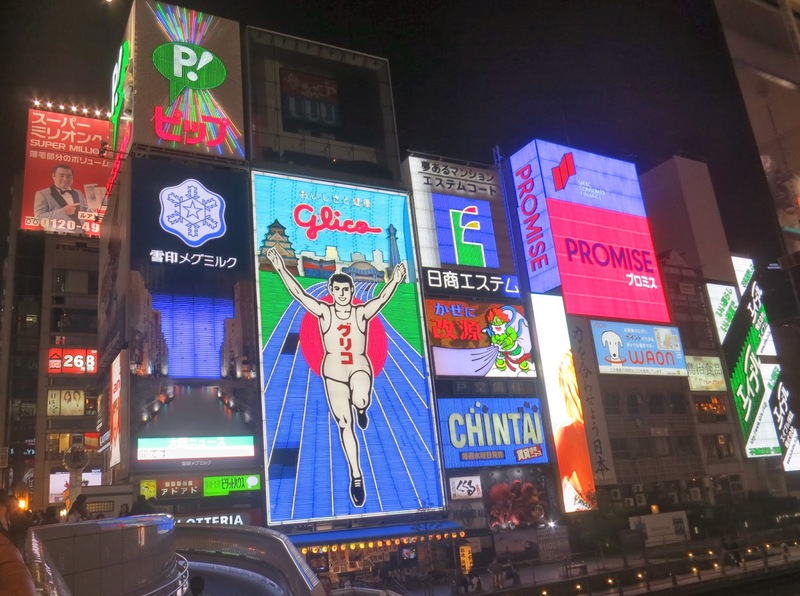 Just as I was settling back into normal routine after our NZ-Aussie trip, my boss calls me and asks, “Are you ready to travel again?” Very soon, I was on a travel assignment to Osaka – Kobe – Kyoto for a distinctlyJapanese experience. Saturated with all things Japanese, I got down to writing about my experiences while juggling assignments at local events with exciting destinations in Singapore. Then we received an email from Pearly saying that she and her daughter, Melanie, will be travelling to Perth in early December and asked if we will join them there? The range of sun protection used among us in Perth! When Ruby asked her to go to Perth, she meant some time next year but Pearly surprised us with a decision to travel this December! So it didn’t take us long to decide to go – again – because this will be a great opportunity for a sisters reunion in Perth. It’s the height of summer Down Under so it was easy to pack lightly for this trip. I remembered to bring along my tube of SPF 30 Sun Protection because I know how scorching the sun can be in the cloudless skies of Perth. My nephew Andrew and his wife welcomed us into their home again in Perth as we anticipated the arrival of Pearly and Mel after their long flight from Heathrow via Dubai to Perth. It will be their first trip Down Under and there will be much for them to experience – especially the extreme opposite to the freezing weather they were leaving behind in the UK. Not only was it a special time for us sisters to meet again in Perth, it was also significant for the cousins to make some new memories together. Andrew and his wife have a trip planned to Zambia as he will be best man for a friend’s wedding there so they had no days off to spare. I learnt they also wanted to have a short holiday in Dubai so they were saving their days for their trip. So when they went off to work, they left Ruby and I to entertain the UK visitors in Perth. While I drove my nephew’s car, Ruby was the able navigator who helped us find our way around using Google Maps on our trusted devices. We became the local guides and had fun showing them the sights from the famous Kings’s Park to historical Freemantle and meeting native animals in Caversham Wildlife Park. 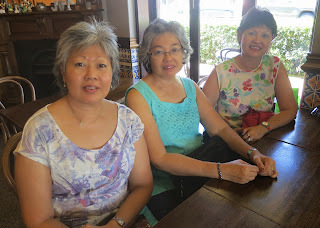 At mid-week, while Pearly and Mel went on the next leg of their trip south to Albany with Sheila, a former classmate who now lives in Perth, Ruby and I returned home as we had a wedding reception to attend in Kuala Lumpur that weekend. With the use of modern technology, we remained in touch with Pearly and Mel as they travelled to Sydney to join our cousins there for a cousinly Christmas celebration. 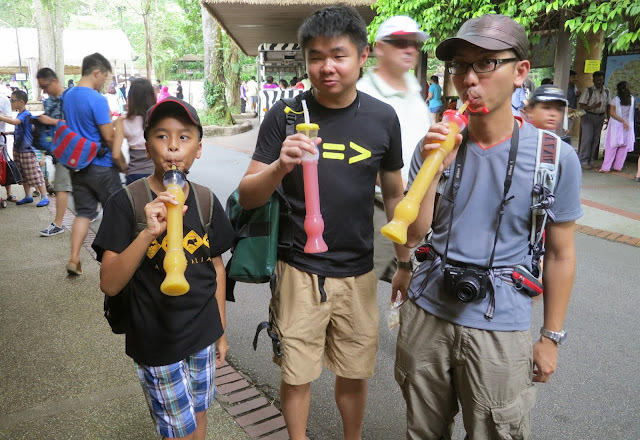 We are kept posted on their fun as we look forward to their arrival for a family reunion in JB and to see our grandmother in the final sector of their epic trip. 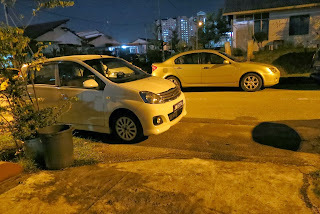 Meanwhile, Ruby and I were in Kuala Lumpur, in our brother’s home on Friday night, getting ready for bed when there was a commotion downstairs. His 2-car porch was occupied so my car was parked across the driveway outside the gate. Their dog was barking and I was shocked to learn that someone was apparently, attempting to break into my car! His voice sounded familiar and my sister-in-law vocalized our confusion: “Andrew?” she asked. When he laughed in response, it confirmed our suspicion. Standing in the light drizzle outside was none other than my nephew and his wife who arrived from Perth to give us a surprise! Our roast turkey for Christmas Day dinner! He had planned this way ahead and did not expect his aunt and cousin Mel to come from the UK and for his mother and me to turn up in Perth again. Throughout our stay in Perth they did not give a hint of their plan to come home for Christmas because we knew they had a trip to Dubai and Zambia. But they did not tell any untruths because they did not give specific dates and we assumed that they would leave directly for Dubai. Instead, they arrived in Singapore on Friday and went to see his grandparents to pick up the car before driving to KL to give us a grand surprise! This must be one of the most pleasant surprises ever as the family was together again to celebrate Christmas at home. Our celebration was more meaningful not because of the gaily wrapped gifts under the tree or the sumptuous meal complete with roast turkey and all the trimmings, but because of the dear people gathered close again at a very special season of the year. Happy Christmas one and all! Another thing that I always associate with New Zealand must be the protruding tongues and eyes of the All Blacks rugby team when they perform their traditional haka chant before each game. So for me, a visit to New Zealand is not complete without a Maori experience. With dinner reservations already made with the Mitai Maori Village in Rotorua, I’m eagerly anticipating, not just the taste of traditional Maori food but also an authentic Maori cultural experience. As dusk falls on this wintry night, the temperature is dipping fast while more guests arrive to join us in the banquet hall. Of course, John, our host plays a vital role to warm us up for the evening and he is quick to “break the ice” among the guests. He welcomed us to the village of the Mitai tribe and named us the Tribe of Many Nations. From his ice-breaking activities, I learn that besides our family from Malaysia, there are guests from US, UK, several European countries and from Australia or “Across the Ditch” – the way Kiwis say it to poke fun at their neighbours! The lady at the reception told me that this is a family-run business that started in 2002 and Minarirapa Mitai-Ngatai, their 79-year old family patriarch, is still involved with it. His shoulder-length snowy white hair clearly reflects his years and he’s seated at the rear of the hall, playing his saxophone to provide jazzy background music. Later when I met him, I told him that I’m from Malaysia and he pleasantly surprised me by saying that the Maori have many words that are similar to our Malay words like mata (eye), telinga (ear), langit (sky) and ikan (fish)! under the sheets of damp gunny sacks! John said the Maori traditionally line the cooking pit with hot rocks and place their food wrapped in large leaves, on clean sticks and tree bark to reduce burning from direct contact with the hot rocks. Then more leaves, sticks and other vegetation were used to cover the food to protect it from being crushed by the weight of the layer of earth on top. As John introduced the structure of the hangi, my eyes are riveted to the large sheets of damp, dark gunny sacks spread out in a heap on the ground. He said the wet sacks are used to trap the heat around the food to bake it in the ground. However, in modern times the Maori have substituted the use of large leaves with wire trays lined with aluminum foil to cook traditional hangi of chicken and lamb and root vegetables like potatoes and kumara or sweet potatoes. John peeled open the layer of gunny sacks to reveal trays of food under a white sheet that was baked in a slow-cook process for about three to four hours. It dawned on me that this food from the pit will be prepared and served for our dinner later and I just couldn’t wait to taste it. Later at the dinner buffet, I recognised the hangi items cut up and served with stuffing and an array of gravy, mint sauce and cranberry sauce. When I sink my teeth into the chicken and lamb, I’m delighted with its smoky, earthy aroma and how the meat is fall-of-the bone tender! To explain the difference between the words, hangi and hongi, John shared a few funny anecdotes about how guests often mistake hongi, the traditional Maori greeting of touching the nose and forehead, for a kiss on the mouth. Such errors of course, resulted in much embarrassment! So once he picked a volunteer to represent the Tribe of Many Nations, John practiced doing the hongi with him before we went into the village to meet the Mitai village chief. It’s bitterly cold and darkness is creeping in as we follow John on a short trek into the bush to the Wai-O-Whiro stream to watch Maori warriors sail in on a waka (war canoe). Maori warriors sailing in on a war canoe! At first I can see lighted torches moving among the trees on the slopes high above the stream but they swiftly disappear. In a few moments I hear the distant sound of traditional chants and it gets louder as warriors, garbed in traditional outfits, paddled in on a canoe. As the brawny warriors alighted to stride into the village, I caught sight of bold tattoo patterns on their faces, arms and legs. 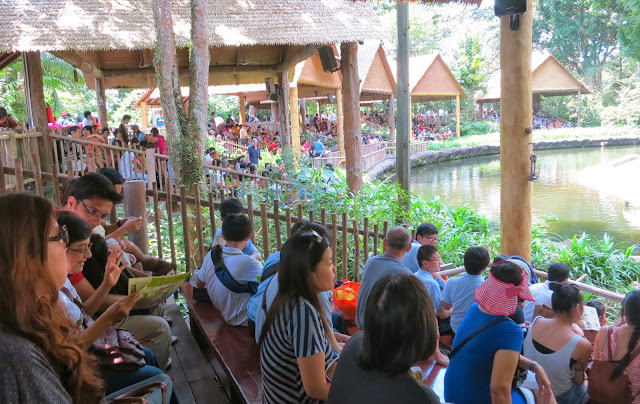 A traditional village is recreated on a stage under a shelter with overhead heating and seats for guests to watch the cultural show in comfort. Speaking with wit and eloquence, the Mitai village chief interacted with the guests and shared more information about the Maori heritage. While members of the cultural group demonstrate the various arts, he told us about ta moko or tattoo art and discussed several types of traditional weapons, the poi dance and the haka or war dance. I’m intrigued to see that not just the warriors but even the women have tattoos on their lips and chins. My curiosity is satisfied when the village chief explained that these tattoos traditionally reflect the person’s ancestry and personal history, his or her social rank, knowledge, skills and even marital status. As the warriors whirl around to perform the haka with fierce foot stamping and rhythmic thigh slapping, I can also see a lot of protruding tongues and eyes. In many cultures, sticking out tongues and widening the eyes are considered rude gestures. But even though these expressions may seem intimidating, I learn that the Maori are emphasizing a point or expressing their passion and are not necessarily being aggressive. Facial expressions or pukana are indeed an important facet of Maori performances. It’s interesting to see that while the men widen their eyes, bare their teeth and stick out their tongues, the women will open their eyes wide and jut out their tattooed chins. Doing the hongi with the Mitai village chief! As I soak in the village vibe, I’m swept away by the mesmerizing rhythm of the haka and can’t help being captivated by the Maori’s rich culture and their pride in the poetic descriptions of their ancestry and heritage. Just got a call from a fan all the way from Terengganu/Kelantan! His name is Tan Ee King and he was touched by your story on Rotorua. He remembers the song but can’t remember the lyrics and was wondering if you could share the lyrics with him. Twenty years ago, Ajith Bhaskaran Dass left a career in law to focus on his passion for Indian classical dance and established Suvarna Fine Arts, his own dance academy. In the past two decades Suvarna has produced distinct and original dance works that combine authentic classicism with universal appeal. 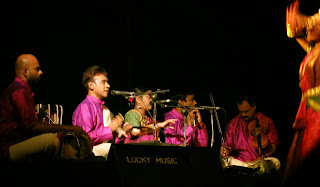 With his mastery of techniques in the rigorous disciplines of both Bharatha Natyam and Odissi, Ajith has collaborated with professional productions locally and abroad to produce an impressive repertoire of performances. Renowned as one of the most accomplished Bharatha Natyam dancers in this region, Ajith has performed in some of the most prestigious venues around the world and was voted Best Male Dancer in the December season of the International Music and Dance Festival in Chennai, India by the Shankarabharanam Trust in 1996. This award-winning, Johor-born performer and choreographer was the first male Indian classical dancer to be featured in the 2000 International Arts Festival in Frankfurt, Germany and also the first Malaysian to perform at the famed Lincoln Center and at the Joyce Theatre, Broadway, New York in 2003. 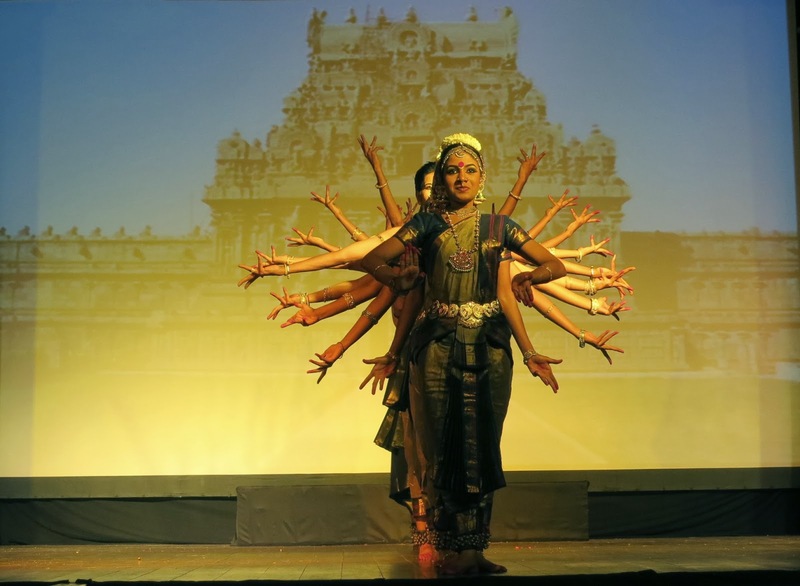 “I’ve always wanted to be both teacher and performer of Bharata Natyam,” said Ajith, who learnt to dance under his illustrious gurus, Adya K. Lakshman and Ramli Ibrahim. Ajith’s teaching style in Survana includes in-depth understanding of the dance rather than learning the steps alone. Even though his students are eager to dance, they must listen to lectures to learn about the concept of the dance and understand the lyrics to the music before they can perform more competently. At age 25, Ajith started Suvarna and he performed its first show with just four students – Sujatha Vijay, Ananthemalar Durairaj, Vijayan Veeryan and Vijay Chandran. These students graduated under his tutelage and are still with the dance academy as teachers. From a humble beginning in Johor Baru, there are now 600 students in five branches of his dance academy located in Pulai, Saleng, Masai, Kulai and Kluang. 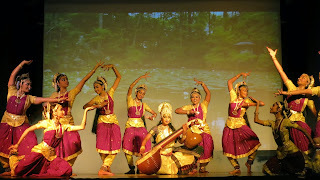 And every year since 1994, Suvarna showcases its students’ talents in elaborate stage productions. Ajith believes in giving his students a holistic education in all aspects of dance, from dancing and teaching to choreography as well as stage production. So in every production, some of the senior students are not only dancers but also given the opportunity to be involved in wardrobe management, set and lighting design and execution. 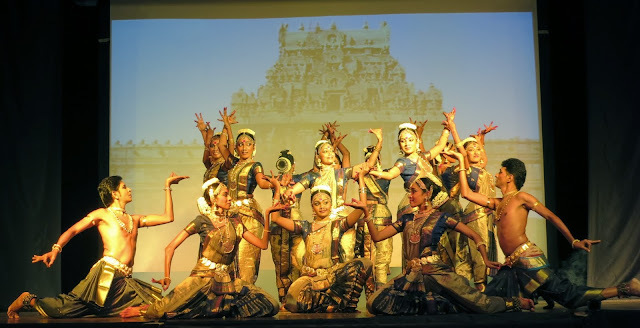 At Suvarna, only students who seriously want to continue dancing will be given their dance debut or arangetram – a solo performance where the guru presents his pupil to the public. 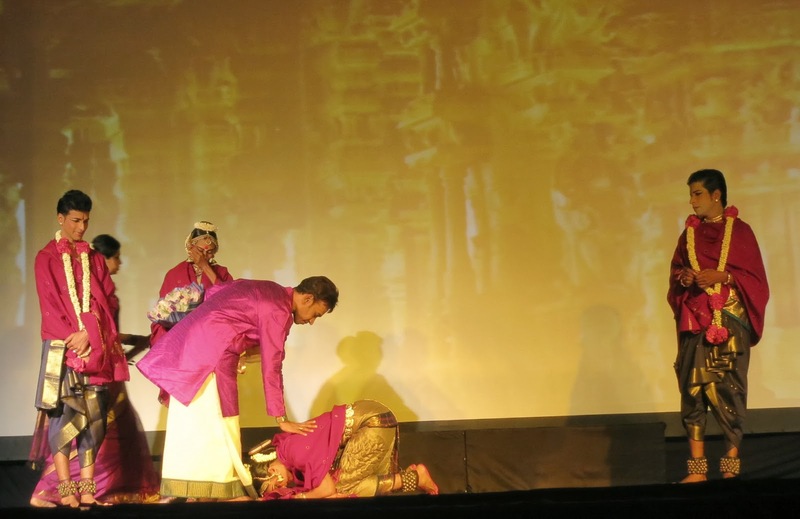 To commemorate Suvarna’s 20th anniversary, a show entitled, Suvarna Shakti, a Bharatha Natyam dance that invokes the myriad manifestations of the Goddess Absolute, was performed recently. Ajith’s older sister, Dr Asha Dass, paid tribute to her brother on behalf of their family in a speech sprinkled with accolades, anecdotes and a bit of humour. Among other things, she said Ajith has devoted his life to Bharata Natyam, not only as a dancer and performer but also as an amazing choreographer. 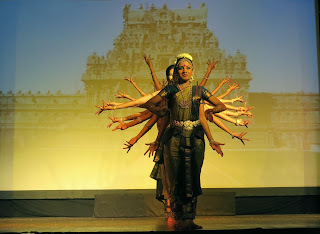 In the tradition of gurus of Bharata Natyam who are well versed in the art of dance as music and the choreographer of the dances, Ajith was the Nattuvanar or dance cymbalist who provided the Nattuvangam as he played the cymbals and recited the Solkattu in rhythmic patterns for his dancers. 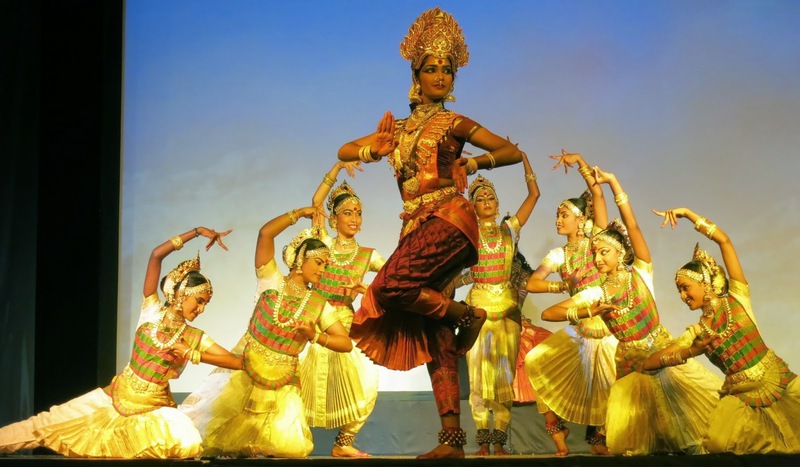 Throughout the show, Indian classical dance enthusiasts in the audience were impressed by Ajith’s experience and expertise as the dancers and the Nattuvanar performed in total harmony. 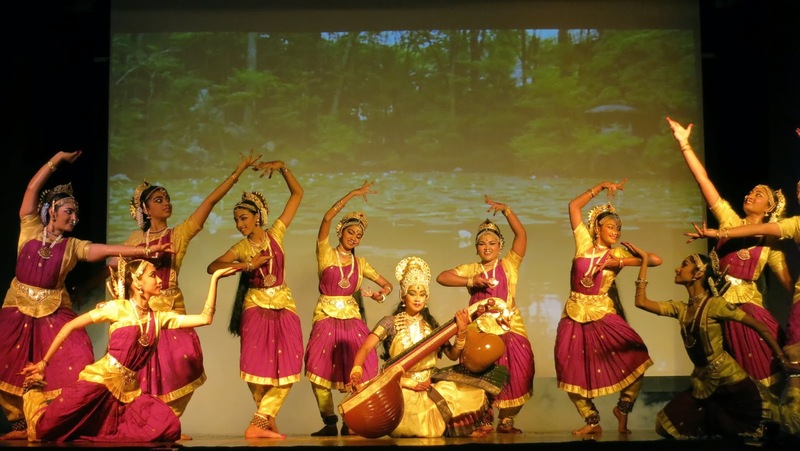 The dance performance was accompanied by a ‘live’ traditional orchestra with Theban Arumugam on mridangam, Manikantan Gurunathan on violin, Ghanavenothan Retnam on flute, Kumaran Palaniappan on tabla and Bhavani Logeswaran’s exquisite vocals. 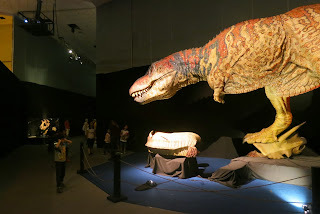 If you are fascinated by the mysteries of dinosaurs but the only ones you have ever seen are from movies, documentaries, books or magazines, then you should visit the exciting and educational “Titans of the Past – Dinosaurs and Ice Age Mammals” exhibition at the Science Centre Singapore. This exhibition will transport you into the prehistoric era of the dinosaurs and Ice Age mammals as it features two international travelling dinosaur exhibitions – “The Growth and Behaviour of Dinosaurs,” which is co-produced by the Museum of the Rockies (MOR), USA Montana and Kokoro Co. Ltd, Japan, and “Ice Age, The Exhibition” from Aurea Exhibitions, Argentina. 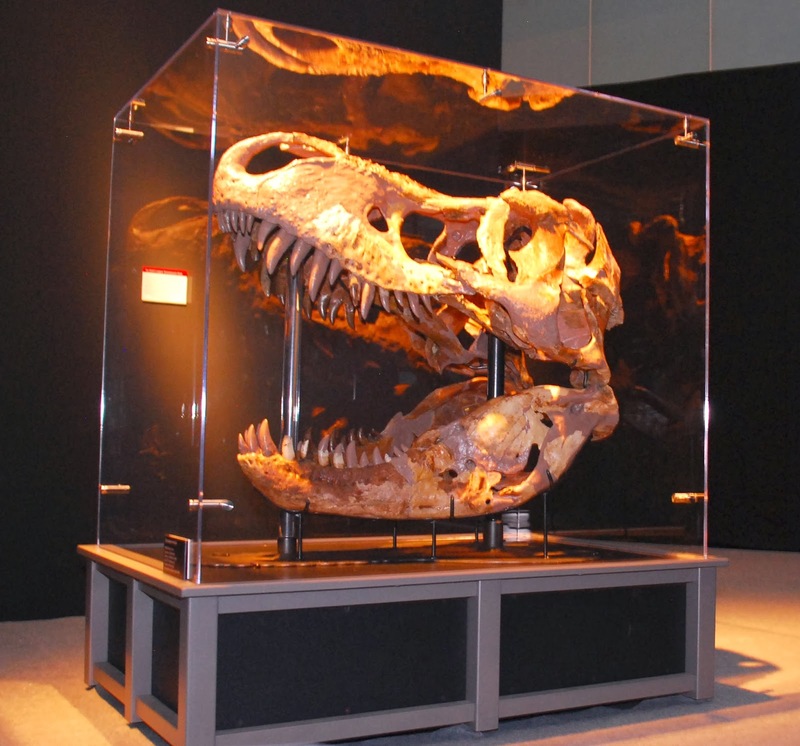 You will have the opportunity to see real fossils that include the largest Tyrannosaurus Rex (T-Rex) skull ever found and Kokoro’s state-of-the-art animatronics that brings dinosaur replicas to life. There are quality specimens of Triceratops, Pachycephalosaurus, Hypacrosaurus and T-Rex and interesting exhibits that track the development and growth of these four dinosaur species that test the latest sensational hypothesis of world renowned paleontologist, Dr Jack Horner and his research team. They discovered more than one third of all dinosaur species classified from the Cretaceous Period that may actually be juveniles and not different species as were determined by paleontologists for the past century. “The exhibition tells the story of a dinosaur’s life using real fossils and specimens that have played a pivotal role to facilitate our continuous efforts to demystify the prehistoric age and uncover new findings,” said Dr Horner, the MOR’s Curator of Paleontology and technical advisor for the famous Jurassic Park movies. 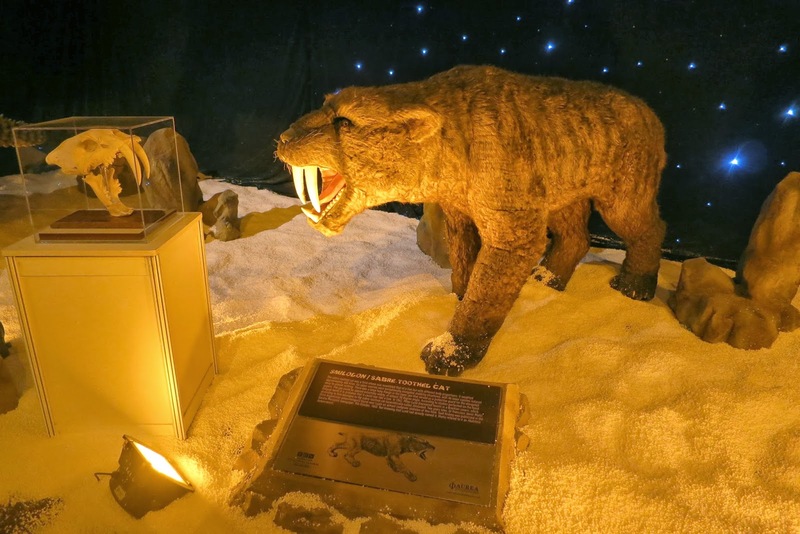 “We are in a better position to showcase the prehistoric era and I am sure visitors will be intrigued by what they see in the exhibition,” he added. 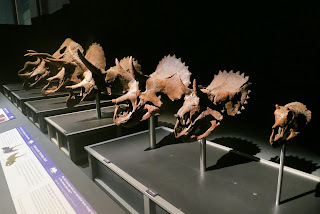 One of the highlights of this exhibition is a series of replicas of Triceratops skulls that track their growth and development from juvenile to adulthood. You will see how their neck shields develop over age, becoming most attractive at adulthood and then fan out into more porous shields as they age. This may be because thick and big neck shields would be impossible to carry as they advance with age. You can play with an interactive display of the Hypacrosaurus presented as Baby, Juvenile and Adult to hear the unique sounds they make at these stages of their life. The Baby makes high pitch squeaks as it probably remains safely within earshot of its parents. However, the sonorous sound by the Adult resonates deep and loud to reach longer distances. 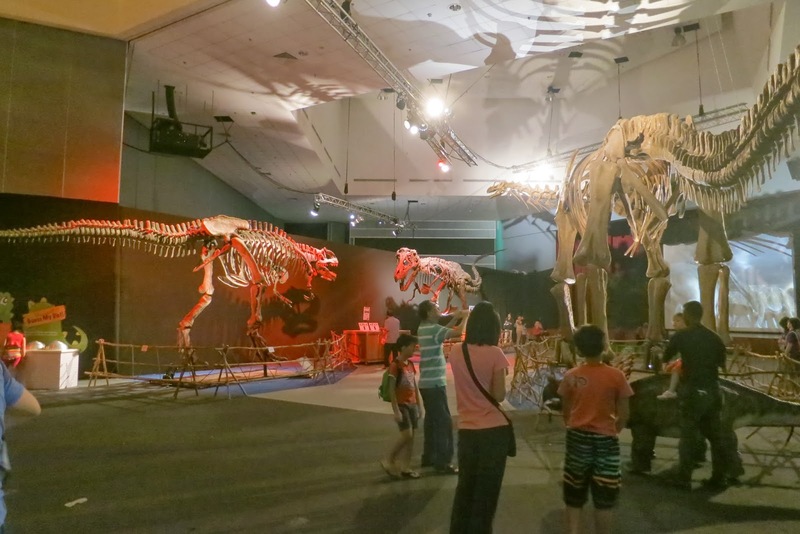 For the first time, two life-size dinosaur skeleton casts and Ice Age Mammals exhibits from the Aurea Exhibitions are being showcased in Asia. You will be awed by the Argentinosaurus that measures 36 meters long and 7 meters high, the largest Sauropod ever found and be thrilled to see the cast of Giganotosaurus, one of the largest terrestrial carnivores in the late Cretaceous period. The Ice Age Mammals exhibition features 10 animatronics animals including the ferocious sabre-toothed cat and giant Mammoth with its massive curved tusks and beady eyes. 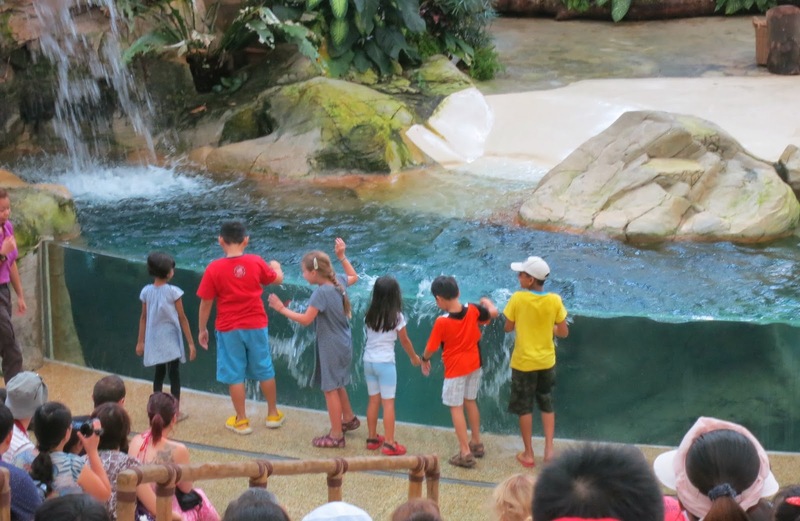 Since the 1970s, the award-winning Singapore Zoo has been attracting millions of tourists to enjoy day-long visits in their “open concept” zoo. 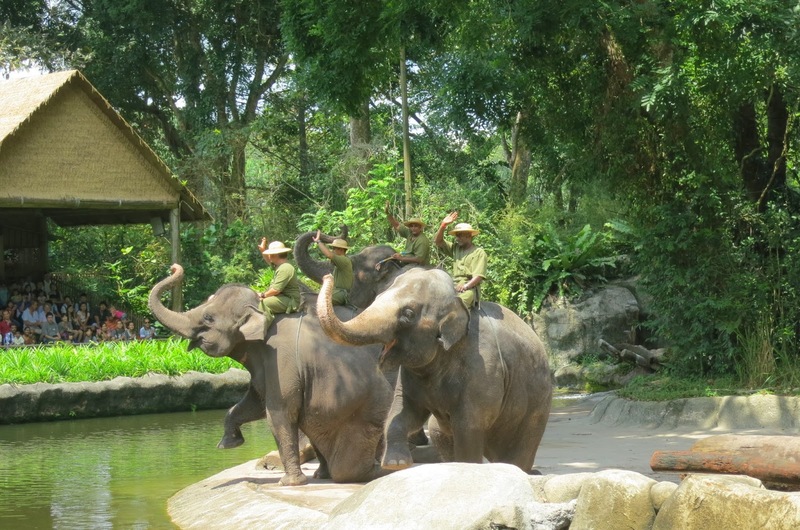 Opened on 27 June 1973, Singapore Zoo celebrates its 40th birthday this year. The Zoo is an evergreen destination which I discovered years ago and have been back again and again with friends and family members. 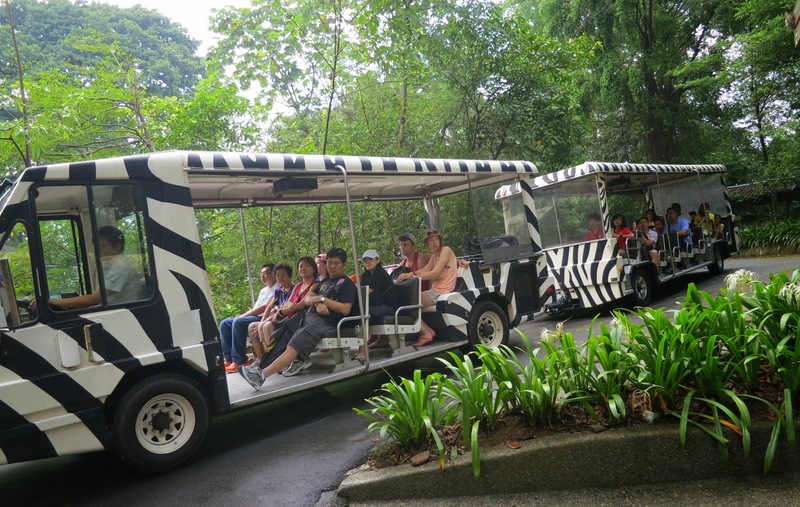 We, who live in Johor Baru, have a distinct advantage because we can take a short drive from the causeway to Mandai, just off the Bukit Timah Expressway (BKE), and reach the Zoo in a matter of minutes. 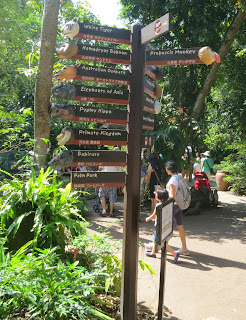 In a recent visit to the Zoo, my friends and I rediscovered the world-famous zoo set in a rainforest environment and enjoyed ourselves watching the animal shows as well as visiting the exciting exhibits. One of our boys volunteered to take part in an animal show and I’m sure he had a splashing good time! 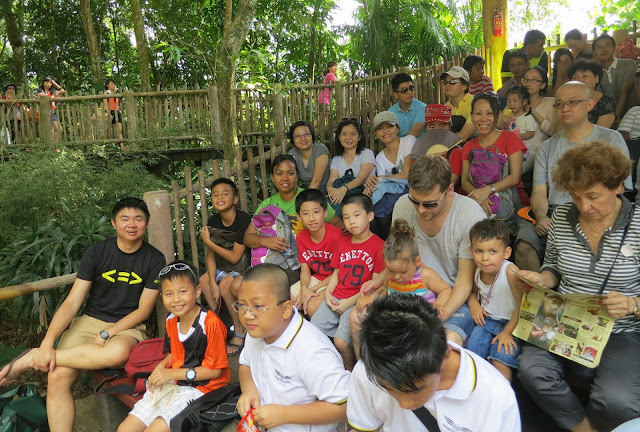 Look out Singapore Zoo, here we come! It was interesting to watch Inuka, the first polar bear born in the tropics, during feeding time in his new Frozen Tundra home. He truly is a show-bear, repeatedly climbing up onto the “ice-berg” and diving for his food, to the delight of his audience. 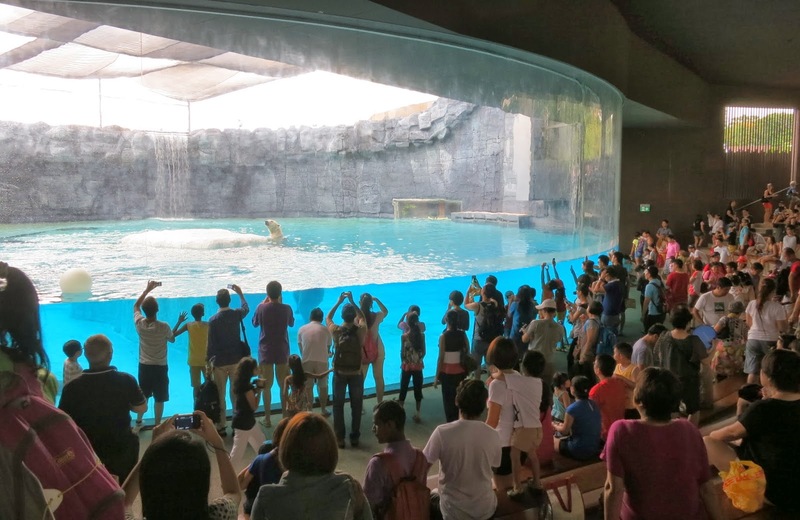 Can you spot Inuka, the polar bear, being watched by such a large crowd of fans? A section of the audience at the Elephant show – can you spot anyone that you recognize? Young volunteers at the Rainforest Fights Back animal show making a big splash! 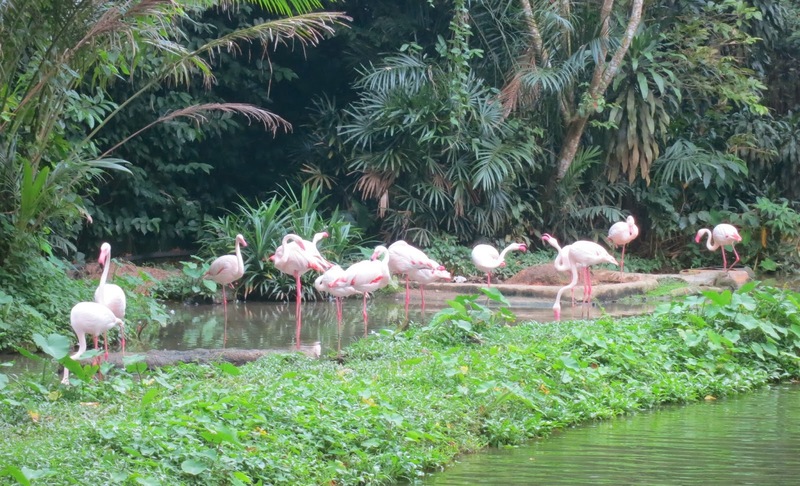 A bevy of elegant pink flamingoes! Slurping down refreshing fruit drinks from fancy bottles! 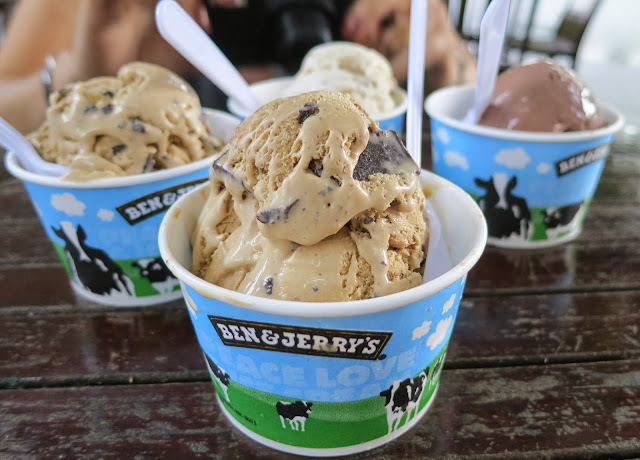 A visit to Singapore Zoo is not complete without an ice-cream treat… Yum! 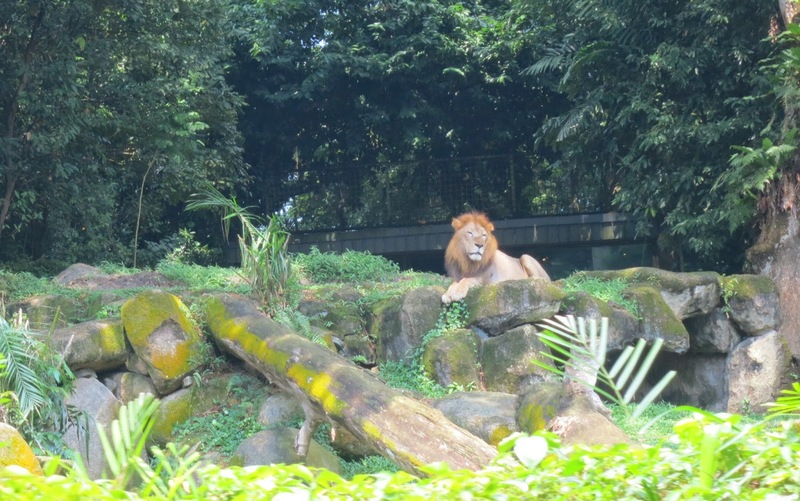 There’s so much to see and do at Singapore Zoo! 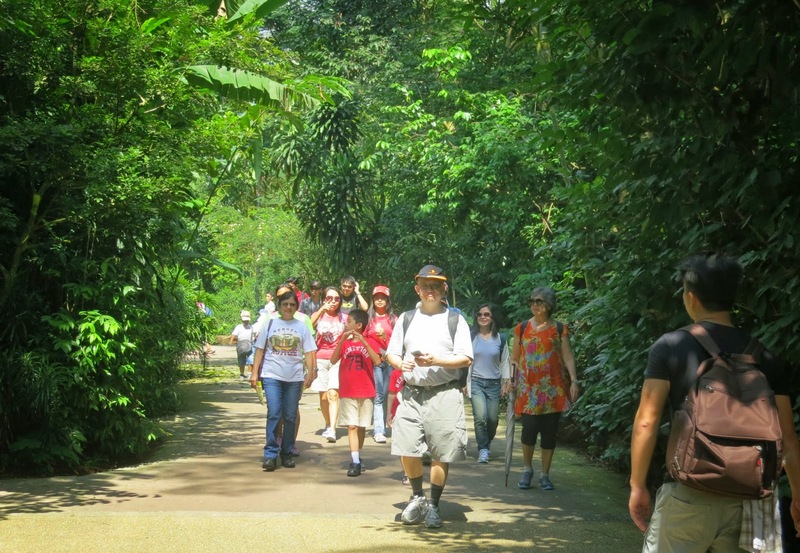 Just grab a map and follow the trails to the various exhibits and don’t forget to check out the times for animal feeding and shows to arrive on time to catch the action and excitement. Singapore Zoo is located at 80 Mandai Lake Road, Singapore 729826. Visit website: www.zoo.com.sg for more info. next to signs like this! I’m not surprised that many readers nodded their heads in agreement when they read my article, Stick to your own lanes (NST, Nov 5) because they are often hapless victims of inconsiderate drivers. Law-abiding citizens here join me in gritting our teeth and impatiently waiting for the authorities to enforce the law not just to nab errant drivers but to educate them for the safety and comfort of all road-users. They are also concerned that foreign investors and visitors in Iskandar Malaysia must also be wondering, how Johor Baru can be a progressive city when their locals behave so lawlessly? As city roads are widened with broader road shoulders, we see cars boldly parked across single white lines and even double yellow lines. Every driver must study the theory part of the driving test but many must have forgotten that just as double white lines in the middle of the road means no over-taking, the double yellow lines on road sides indicate that parking is prohibited. Town-planners everywhere create road shoulders not for parking but to provide comfortable leeway for cars to move in case of emergencies. Narrow roads in older parts of the city are supposedly beautified when they were bordered by walkways in wide pavements. This however, eliminated the linear parking spaces in front of the shops and because most people are too lazy to park in the proper places and walk a few steps, they boldly park on the pavements. Yes, they park haphazardly right across pavements in these narrow streets and this obviously defeats the city’s grand plans for any beatification! 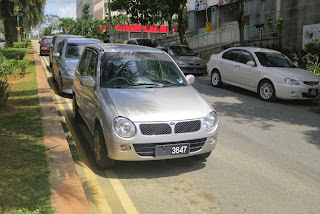 Cars are parked on both sides of the road in JB city! Parking on pavements not only destroys the city council’s idea in preserving the charming landscape in the older parts of the city, the parked cars are an obstruction to tourists on walking heritage tours. Take a look at Tan Hiok Nee Heritage Walk and the sight of carelessly parked cars on both sides of the narrow road is enough to put off any tourists trying to explore the place. 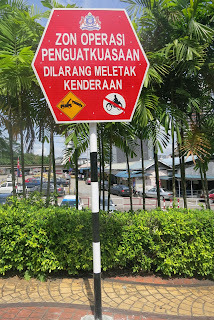 The city council ambitiously created the Meldrum Walk but there is no fun in walking the network of roads around Jalan Siu Nam, Jalan Siu Koon and Jalan Siu Chin in historical Kampung Wong Ah Fook because the pavements are not only full of parked cars and motorcycles, they are also spoiled by hawkers who have set up tables and chairs there! A reader, who was once a traffic officer, gave me an earful about the appalling traffic issues in the city which is getting worse because of the lack of enforcement. I share his frustration because we know that in spite of clear signs put up by the city council, warning of towing away of illegally parked vehicles, the cars are still boldly parked right next to the sign every day. By continually ignoring the rules and parking there without penalty, they are making a mockery of the authorities! These motorists clearly ignore the double yellow lines! Motorists who have been abroad are aware of the traffic enforcement in cities like Singapore, Australia and other international destinations. They know that the Police mean business and there is a price to pay for any traffic offence so they abide by the rules. 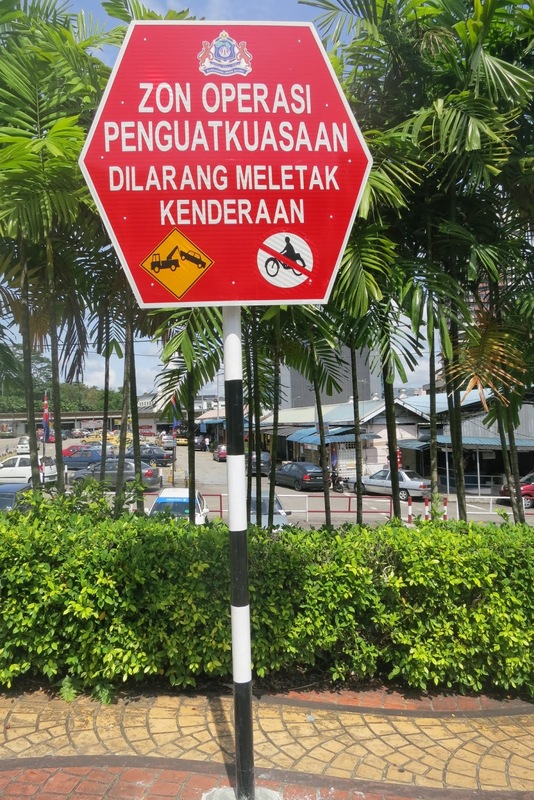 But in Johor Baru errant drivers openly disregard traffic rules and have no regard for the Police and city council authorities because these rules are not consistently enforced here. I agree with this retired traffic officer who said that the only way to educate and eradicate such inconsiderate attitudes on the road is through stringent enforcement. We know there are parking facilities in multi-level car-parks and small parking lots in the city but because there is a cost and some walking involved, people just refuse to use them. Also with flexible payment packages to own a car now, there are just more vehicles on the road than the number of parking spaces available in the city. With Visit Malaysia 2014 just around the corner, we should make constructive decisions to take control of the traffic situation in our city that Tourism Malaysia dubbed, the Southern Gateway into Malaysia. The city council must work towards providing sufficient parking facilities that are safe, clean and fairly priced to encourage more drivers to park their cars in proper places. They must study how busy cities around the world are dealing with parking in the city centre and suburbs, and quickly adopt practices that are already efficiently working elsewhere. It is a shared responsibility between the authorities to enforce rules and the motorists to revive our tradition in courtesy and civic consciousness in order to educate and change the mindset of young people and even hard-nosed seasoned drivers. If we want to progress as a modern and developed city, we cannot continue setting poor examples on the road and develop new generations of drivers with bad attitudes. It is most damaging if young people observe their parents and elders blatantly flouting logical traffic practices because they will just learn by example. Fans of Harimau Selatan, Johor’s slick football team, can start by practicing common sense courtesy rules like never to park across someone’s driveway because your car will obstruct the path of the homeowner who needs to enter or exit his driveway. The Police and authorities must step up to the plate and enforce obvious traffic rules while showing their humane side by advising obstructing cars to move along instead of slapping them with a summons. 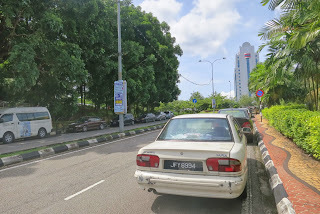 It’s time for Johor Baru authorities to earn the people’s respect for the right reasons. People traditionally think of Japan as the Land of the Rising Sun or Cherry Blossom Land but recently while I was travelling around Osaka, Kobe and Kyoto, I only caught sight of the setting sun one evening. 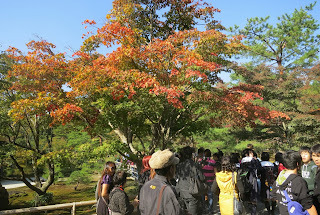 While it’s not yet cherry blossom season, I still enjoyed seeing a beautiful palette of autumn shades in reds, orange and yellows against a green backdrop. My earliest connection with anything Japanese must have been my pair of Japanese slippers. These were common rubber slippers or flip-flops made with a white base and blue thongs that I used to wear around the house when I was a kid. When the threads on its soles wear out, the slippers can be ever so slippery on wet floors and I remember falling clumsily (and painfully!) because there was no grip from my old pair of Japanese slippers. In the early days of Black & White television, my brother and I used to watch a popular Japanese TV series, Ultra Man. The dialog was dubbed in Malay and I remember being irritated because the mouths of the actors were never in sync with the words. But we still enjoyed watching the superhero, Ultra Man being summoned (a light will flash in his chest!) to fight those horrific monsters. In every episode, there will be some horned, fire-breathing, plastic-looking dinosaur or gigantic creature – generally called a raksaksa (Malay word for ogre or giant!) 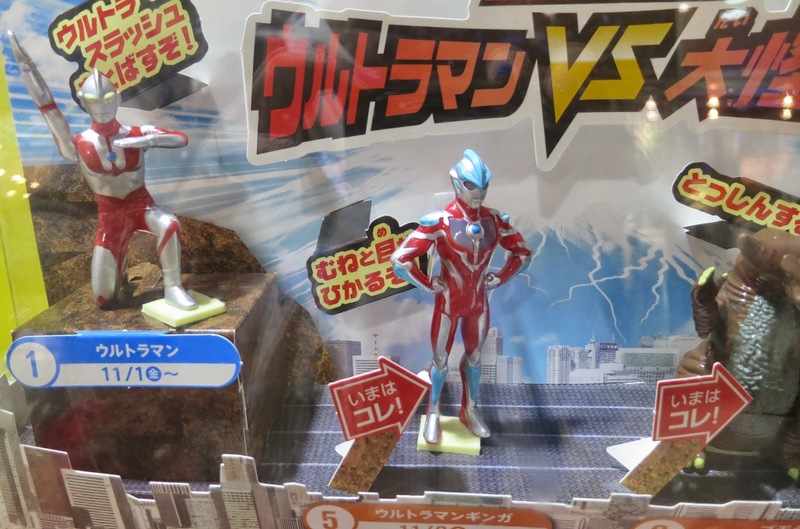 – that will inevitably be defeated by Ultra Man. Monsters are always destroyed, not just by Ultra Man’s powerful punches and karate chops but also by the super powers that will radiate from his crossed forearms! If you are smiling now, you know exactly what I mean. But in our young minds, this was the heady stuff that superheroes are made of. the part of the model of a raksaksa at far right! 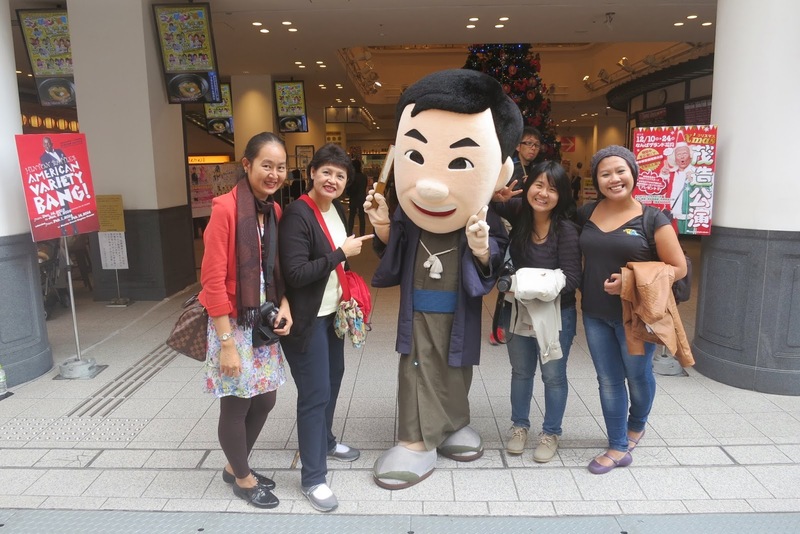 The final stop of our itinerary in Osaka, before we headed to the airport for our return flight, was Rinku Premium Outlets [same brand as our Johor Premium Outlets!] 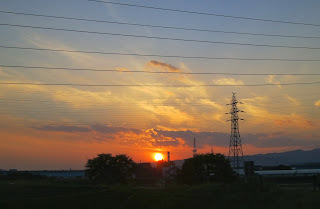 in Rinku City. In the short trek from the railway station to the mall, I passed a McDonald’s and my attention was caught by a showcase that displayed Ultra Man collectibles, complete with figurines of raksaksa monsters! I’m just fascinated that Ultra Man is still very much alive and being enjoyed by the current generation of youngsters. This certainly brought back a flood of memories of how my brother and I used to enjoy watching Ultra Man on TV! Another early Japanese influence must be from “The Samurai” TV series that was also dubbed in Malay. I cannot forget how he was hero-worshipped by a youngster who often chased after him yelling repeatedly, “Shintaro! Shintaro!” I remember watching with fascination, how this kimono-clad master swordsman could defeat armies of ninja antagonists, without breaking a sweat or messing up his neat costume. Those black-clad, fleet-footed ninja warriors can rain a series of darts at Shintaro but with his swift reflexes, he can nimbly escape being a target. I can still picture his stealthy look wearing a dark kimono with a top-knot pony tail and how he sometimes wore a large straw hat. 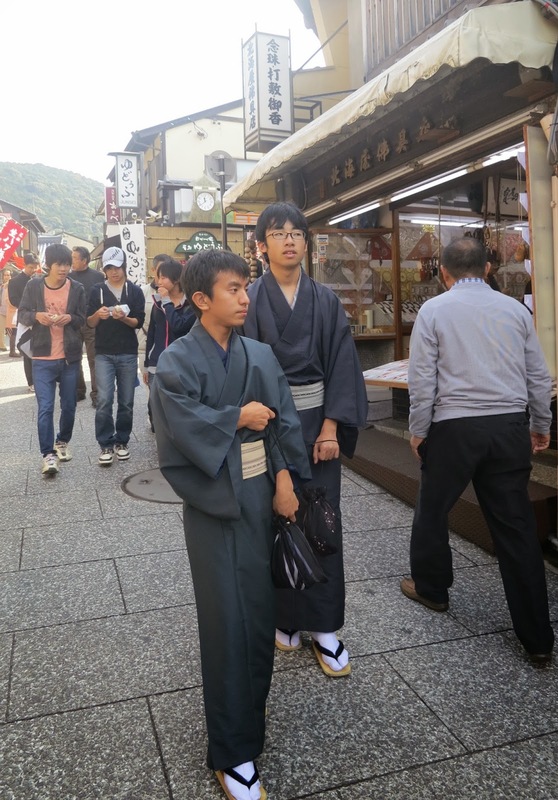 Sadly in the few days I was in Japan, I did not see any Shintaro look-alike and the only kimono-clad men I came across were several school boys, probably on a field trip to the shrines. In school, I was introduced to a popular Japanese brand that I’m still using to this day. My friends know that I don’t leave home without it because since receiving free samples of it in school, I have trusted this product to ease any itch caused by insect bites. If you guessed Mopiko, you’re right! Since I’m a favourite target of hungry mosquitoes, I keep a tube in my bag so that each time I get a bite, Mopiko can always come to my rescue! During our schooldays, Glico Pocky was a popular snack. These pretzel sticks coated with chocolate were a coveted item among other favourite snacks like Smarties chocolate buttons and Mentos mints. I can still remember one of the clever TV ads that featured cute Japanese girls with good teeth and bright eyes, holding the uncoated end of the pretzels and chewing into the crispy chocolate-coated Pocky sticks while they winked and exclaimed, “Pocky!” You will agree that something like this is quite unforgettable. And then one cool night in Osaka, when we stopped at the Shinsai Bashi-Suji shopping area to look at the dazzling neon lights, I saw a giant-size billboard of the Glico Man emblazoned in neon lights and fond memories of the Pocky Japanese snacks came rushing back. One evening, after an especially eventful day, we finally arrived at our hotel for the night. 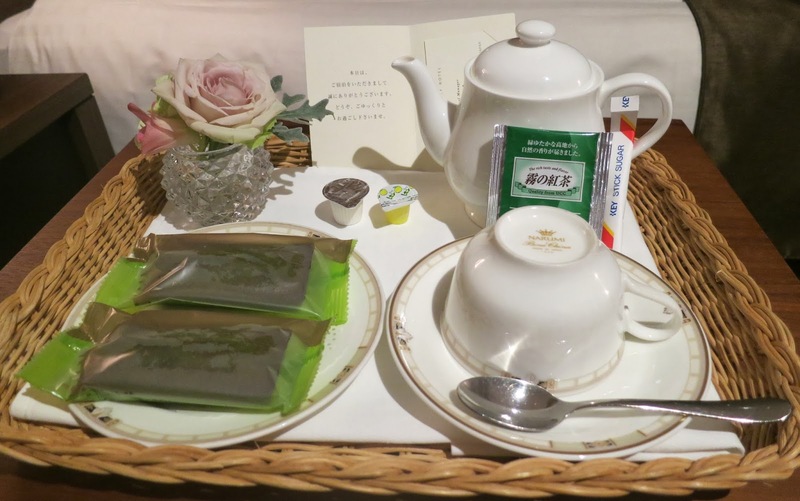 While we were in the lobby waiting to check-in, I was pleasantly surprised when Matsumoto-san, host representative from New Kansai International Airport, presented each one of us with a Green Tea Kit Kat. After such a taxing day, a kind gesture like this simply sweetened my day! I was among four other media representative from Thailand, Indonesia and Malaysia who incidentally, will each share our Japanese experiences in Thai, Indonesian, Mandarin languages – while I will write in English. Delicious Green Tea Cake [Left] on welcome tray! 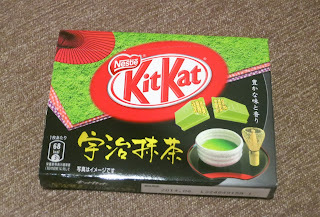 ﻿﻿Matcha or Green Tea is distinctly Japanese and I’m glad that Green Tea is one of their Kit Kat flavours. I must confess that when I closed the door to my hotel room, I dropped my stuff and started to take photos of the Kit Kat box! On its reverse side, the box even has a gift tag with “To and From” printed around a space left blank for you to write a message. 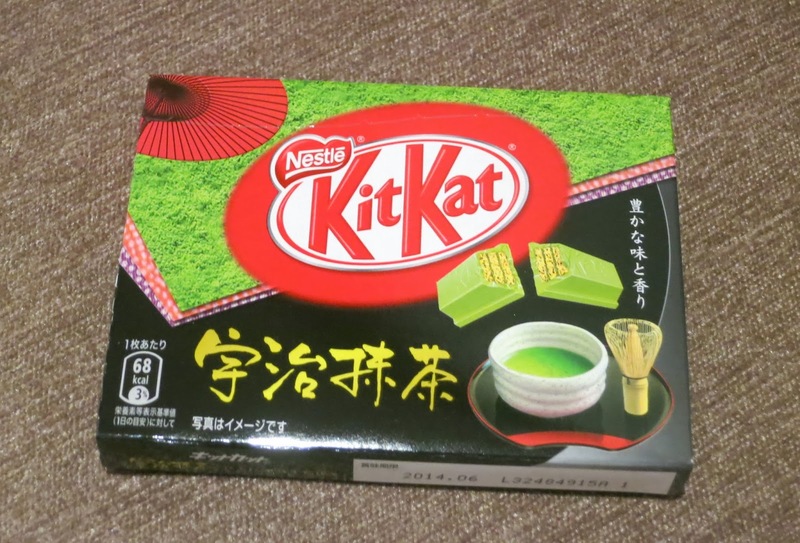 I later learnt that there are 15 flavours in a limited edition pack but with such an eventful itinerary, I didn’t get around to buying any varieties so this only means that I must return to Japan to sample more Kit Kat! 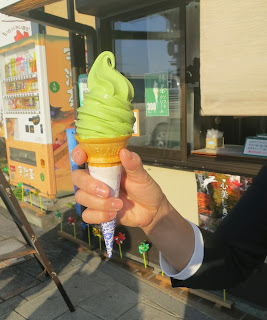 I prefer green tea as a beverage but in Japan, green tea ice-cream is very common and I discovered that I can also appreciate green tea in a delicious soft cake packed as a hotel premium item. 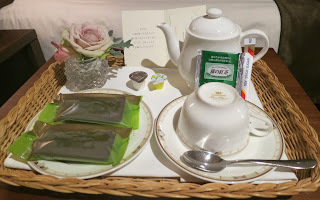 I found two pieces of green tea cake on a welcome tray, presented with a pot of tea [sachet of Earl Grey Tea alongside!] complete with a posy of real flowers – blossoms of rose, hydrangea and orchids – in a low crystal vase! It was a nice gesture and I did not hesitate to taste the green tea cake and before I knew it, I have finished all of the two pieces! I find the distinctly Japanese custom in bowing and greeting both courteous and charming. I’m impressed that even hotel staff, who obviously do not speak English, will greet me with a pleasant Ohaiyo Gozaimasu when we meet in the corridor or lobby. After the first day, I started to adopt their habit of bowing low from the waist each time we thanked the hosts or left an establishment. I know that this can’t be wrong because they only reciprocated with more bows! 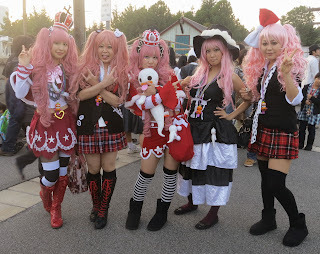 A group of Japanese girls we met in USJ posing for us! 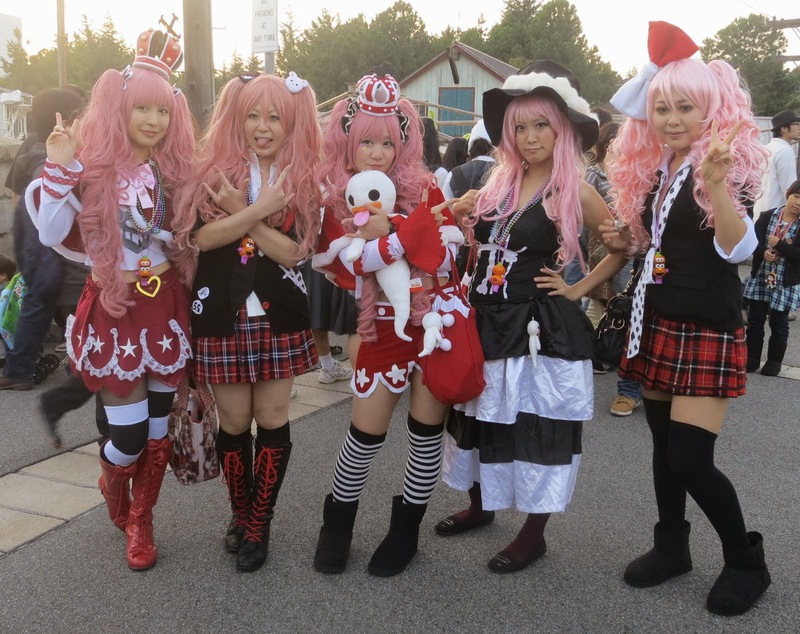 Two things I discovered about Japanese young people: One is their passion for cosplay (short-form of “costume playing”) i.e. dressing up in outlandish costumes with outrageous hair-dos to look like anime or manga characters and the other is their automatic reflex to put up two fingers in a peace sign whenever they pose for a photo! Their “auto-photo-reflex” became so apparent that we curiously asked our Japanese friends about it but they don’t have any logical explanation. At all the tourist spots and particularly in Universal Studios Japan (USJ), there was plenty of photo-taking and everyone invariably made some hand sign while most perpetually had two fingers up with every cute smile and animated pose! 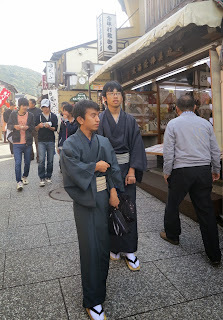 The Japanese are not only friendly and courteous but also very animated in their expressions. This was especially apparent in USJ because here’s where fun is a serious business. The animated excitement around us was so terribly infectious that it was not long before I was swept along into a carefree and crazy mood. Caught on camera with Hello Kitty in our warm embrace! 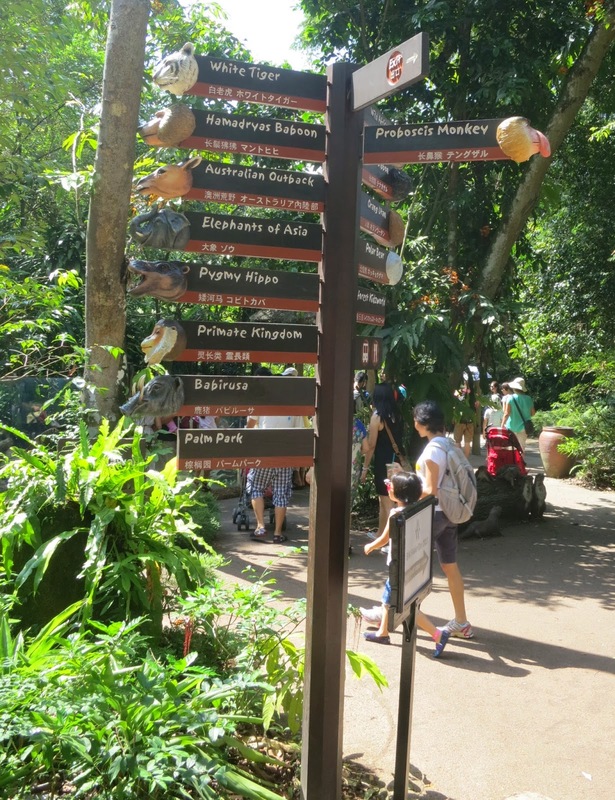 I was particularly keen to experience USJ because I wanted to see the similarities and differences between USJ and Universal Studios Singapore. 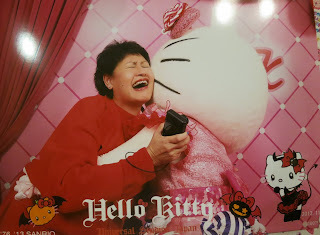 I was thrilled to discover that one of the animated characters in USJ was Hello Kitty – a familiar friend to me because Sanrio Hello Kitty Town is opened in the Puteri Harbour Family Theme Park, Johor Baru – the first to be established outside of Japan! 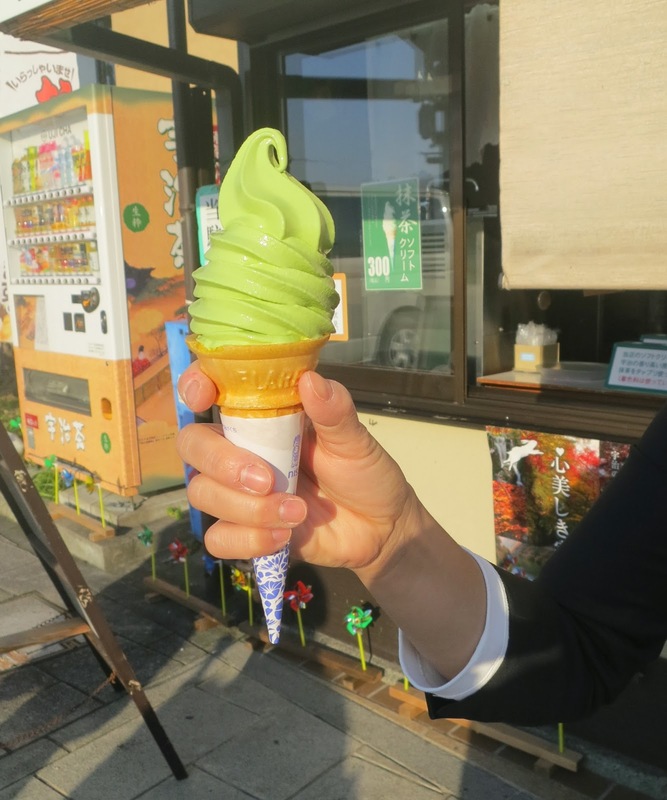 This is just a glimpse of all that’s distinctly Japanese but there’s much more that’s both familiar and so uniquely Japanese to share in separate posts. 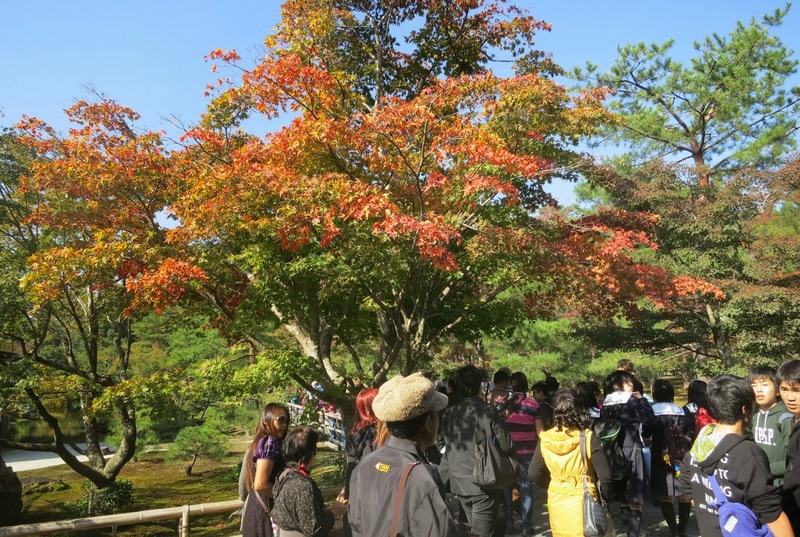 From train rides, boat cruises, tower views, mountain ropeway and cable-car rides, shopping malls, heritage attractions to the fresh fish market and elegant Japanese meals, among other interesting things. And when it was time to leave Japan, my friends and I agreed that the one thing we will miss most about Japan must be their clean, dry and oh so comfortable toilets!